There’s a lot going on when you are building a product. You have to jostle for product positioning, clearly identify the product’s go-to strategy, and drive demand around that strategy to grab the attention of the customer. All these steps are necessary, and essentially that’s what ensures the overall success of the product. What separates a successful product from the rest of the field is not just a clear product-driven strategy, but the attention that’s paid to customer feedback. Most companies say that they listen to their customers, and it’s true to some extent. But the larger truth is that customer feedback is often ignored because companies do not know how to get it, let alone how to make product decisions based on it. Ashley Greene heads Instratify, an agency which provides research to companies to help them build better product features. She vouches by the power of customer feedback. “Understanding your customers better than they know themselves (and your competitors) and transforming that understanding into actionable insight across functions is one of the only sustainable advantages left in competitive markets like software. It’s never been easier or cheaper to build product… that means great features are table stakes. 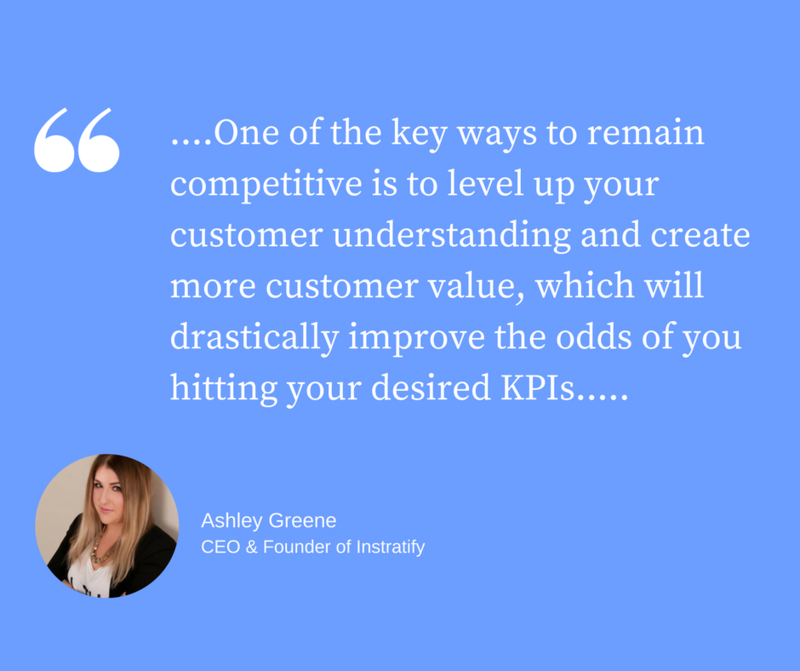 One of the key ways to remain competitive is to level up your customer understanding and create more customer value, which will drastically improve the odds of you hitting your desired KPIs. If we examine the fate of failed products, we’ll often find a failure to value and utilize customer feedback. Kodak resisted the customer’s desire for digital cameras and Blackberry couldn’t provide cheaper models and powerful operating systems to its users. Netflix lost 80,000 subscribers and was rated one of the most hated companies in a survey when it ignored customer feedback and decided to split its DVD and streaming businesses! Why Should Customer Feedback be a Focus For Companies – What Do Experts Say? Actively listening to the voice of customers and applying what they say to your product development framework is a secret for success. This is how you address your users’ actual needs and build features that they really want. By doing this you’re not just improving engagement and success, but reducing churn as well. “Customer feedback is crucial at any stage in building and running a brand. One of the most overlooked stages, however, is in reducing churn. If you know from talking to your customers that they need something in order to remain a customer long-term, that item might get moved up on your product development list. Sure, you might not do that for a single customer but if a large portion of the customers leaving your platform are doing so because of one missing feature that’s on your roadmap anyways, moving it up can save you, customers, you’ve already converted once. Once you understand the benefits of customer feedback and how it can help your product to scale, you have to learn how to acquire it from your users. Customer feedback surveys, feedback boxes, and usability tests are some of the ways to get qualitative data from your users. It is completely legit to be biased towards quantitative data; analytics and data will help you get to the bottom of what works and what does not. But qualitative data in the form of first-hand feedback is what will allow you to discover the ‘whys’ behind your users’ actions, something that Talia Wolf swears by. 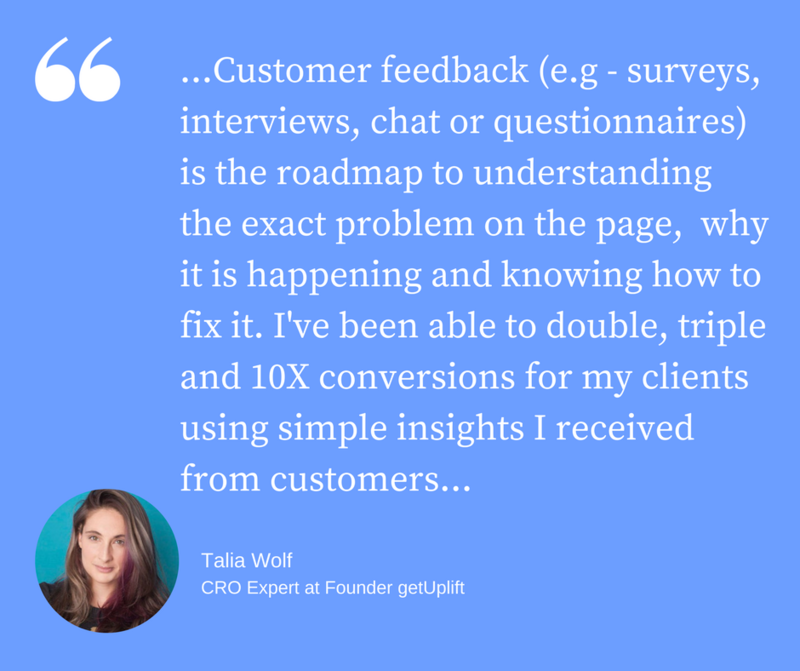 A CRO expert and founder of getUplift, Talia has used qualitative feedback to optimize her client’s funnels over and over again. “Without customer feedback, you’re essentially just playing a guessing-game and hoping for the best. Done correctly, customer feedback can determine the marketing strategy of your entire business, your tone and voice, your retention program and every single line of copy you write describing your product. Most companies focus on being data-driven, looking at the numbers, analyzing the graphs and finding the leaks in their funnel. Challenges start when they try to fix those leaks and have no idea what changes to make. David Hoos from TheGood, a conversion rate optimization agency, approves of this approach and believes that it’s something that every product team should consider. “What we’ve found is that customer feedback, often in the form of user testing or surveys is a vital part of the process of finding improvement areas. We can use qualitative (analytics) data to identify bottlenecks on a client website and then turn to qualitative data (user testing and surveys) that are focused on those problem areas to determine exactly why the bottleneck is occurring. “We had a client that sold high-end artificial flowers that are sold for hundreds of dollars but never need to be replaced. They had a very poor conversion rate and it wasn’t clear why. Thus, qualitative data holds a significance of its own. But what’s equally significant is the ‘when and how’ surrounding it. According to Nichole Elizabeth DeMeré, a SaaS influencer and Community Growth at Zest.is, qualitative data is significant in increasing both response rates and the accuracy and quality of those responses. Focus on core metrics that you’re able to track over time, like customer satisfaction (CSAT), net promoter score (NPS) and customer effort score (CES). Surveys ask very few questions, and you’re confident they’re the right ones for the context. Surveys deploy at specific, strategic parts of the customer journey so you can capture the clearest, most accurate information on CX and friction in the moment, as the customer is experiencing it, rather than after the fact. Surveys automatically deploy at the right time in the customer’s lifecycle – ie. when they’ve experienced your product or service enough to provide valuable feedback. You’ve identified the optimal channel (e.g. email, in-app) to send surveys to achieve the highest possible completion rates by your customers segments. You let customers tell you what is important to them. This means fewer multiple choice or scale-type questions, more open-ended, free response sections. All survey responses trigger “follow-up” communications that acknowledge concerns and show appreciation for feedback. The most challenging part — creating a customer feedback program that’s both measurable and actionable. 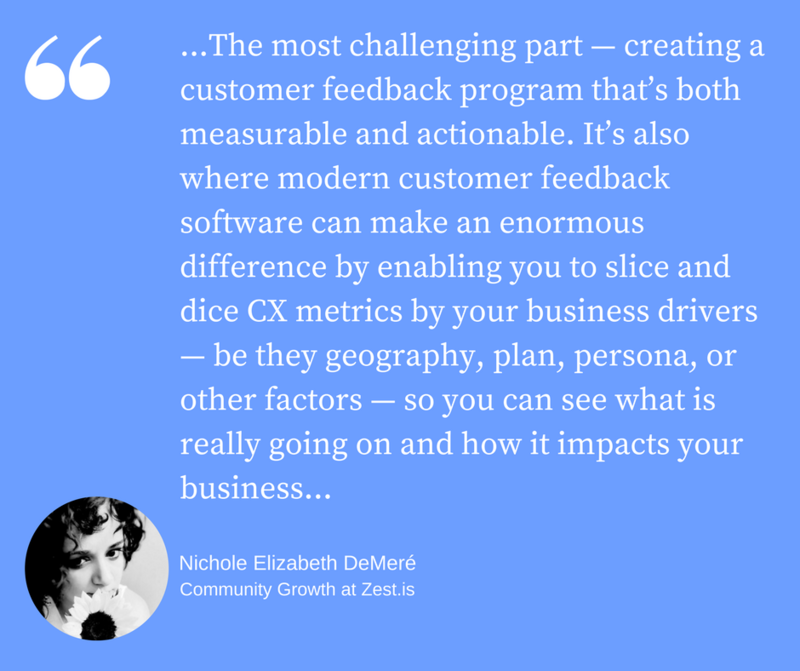 It’s also where modern customer feedback software can make an enormous difference by enabling you to slice and dice CX metrics by your business drivers — be they geography, plan, persona, or other factor — so you can see what is really going on and how it impacts your business. And the customer feedback process doesn’t stop when you get the answers. You have to close two loops. First, your customers need to get answers from you, too. Some just require acknowledgment, a little appreciation for their time. Others warrant high-touch help. Modern customer feedback program means delivering the appropriate response easy, at scale. Henry Ford once said, “If I had asked people what they wanted, they would have said faster horses.” This approach might have worked for Ford in his time, but not asking today’s users what they want can be detrimental to your product’s health. We have so much data at our disposal that’s it’s a challenge to use or understand it to the fullest. While most companies sit in the gray area with their data, Salesforce reports that top companies look at an average of 17 different data points. But does that mean that all the feedback deserves attention? What feedback actually matters? How do you decide what’s worth acting on and what should be ignored? Intercom has a straightforward philosophy around this. The team believes that aspirational statements from customers and hypothetical and third party statements have little or no value, and hence the kind of feedback that should not rattle you. In fact, it is best avoided. What’s more important is to ensure that you don’t fall prey to confirmation bias and dishonest feedback. Clearly, putting feedback to use requires a clear strategy. Prioritize feedback from long-term and regular customers. Look out for unsolicited feedback, the kind that’s unprompted. Look out for the volume of feedback for a particular change. Pay attention to repeated feedback. Making data more actionable will vary from one company to another. However, the bottom line is to clearly summarize it in a way that makes it easier for the team to see the big picture and come up with an actionable solution. Intercom advises categorizing the feedback into themes. Drift, on the other hand, focuses on the ‘Spotlight framework’ mentioned below. Having evaluated the need for customer feedback, its benefits and the right way to seek it, let’s dig down and examine the various methods in which companies are using it to improve their products. Zola, an online wedding registry, used NPS feedback to substantiate their own hypothesis about what young, soon-to-get-married couples want as gifts. However, they focused heavily on the feedback coming from detractors. The team used this feedback to build a stronger registry and added features such as a ‘call us anytime’ facility for users who weren’t well versed with the online landscape, thereby improving their product offering and increasing adoptability. “It goes without saying that customer feedback is imperative to not only understanding your customers’ expectations, but also to how you mature your product. “At Quuu we run quick in-app surveys on a regular basis to gather user data that will inform our marketing literature and give us an insight, no matter how basic, into the minds and expectations of our users! We tend to use Intercom’s built in service for this, but in the past we have also made effective use of a simple TypeForm linked from an email. 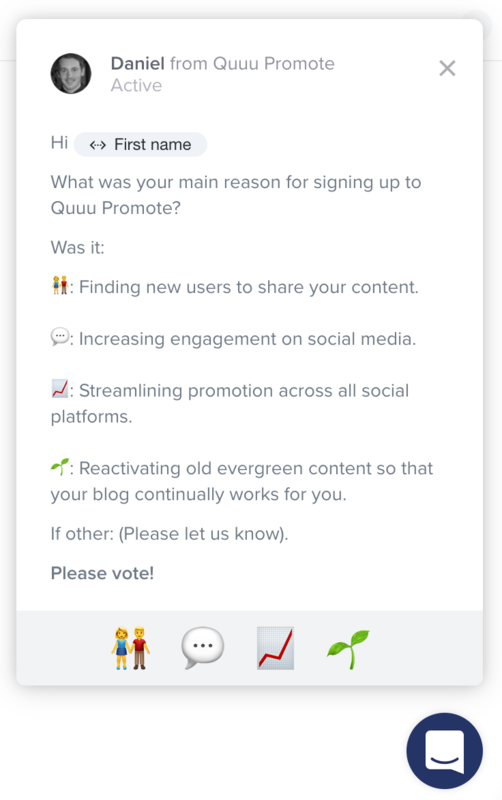 This clearly tells us that the awareness of our users about using Quuu Promote to streamline promotional efforts and in order to reactivate old evergreen content was much lower than we’d like. So we can now focus on raising awareness of this in our ad campaigns and making it more prominent on the site. It was such a low level of effort to gather this data, but boy is it powerful. This customer feedback helped them understand that many of their users were actively selling goods via social media channels, especially Instagram. They jumped to build an MVP quickly and got their most active users to beta test it for them. By the end of the process, the company saw 20% of users identifying with the feature and integrating with it. “We communicate and collaborate with our Member Advisory Board of 78 members (and growing!) through emails, but not just any emails – we build a genuine relationship with our members and have real conversations with them. A handy perk of us providing individualized emails for all members’ suggestions is that we can collect feedback in a personal one-on-one communication where a member can feel comfortable sharing. “We will eventually invite our super members to join us on our Slack in a channel that’s just for them. Here they’ll be able to reach our entire Zest team and get a response asap. We realized that members just wanted to be a part of the movement we created, so we started asking who wanted to be in the loop with almost everything we do, and the reactions were overwhelming. Today our MAB is comprised of marketing leaders – CEOs / founders and VPs / CMOS – but also Junior to mid-level marketers. Building products that your customers will love is a win. Imagine being able to do it every time. It’s not about building what you think would be revolutionary, it is about building what people need. Remember the quarter-inch drill? I can’t emphasize enough on the benefits of customer feedback and how it can provide you with valuable insights on building a better product. All I can say is experiment with your approaches and listen to what your customers are actually saying. Leave your comments or insights about customer feedback in the comments below! As a product developer, it is amazing the feedback/ideas I get from my customers. Ideas I never would have thought of. We think we know what to build into our products. We think we know what will cause new customers to come storming in, but we really have no idea. Indeed Customer Feedback is quite important for any business. Because even if your sales are going up, feedback is essential for future growth. I think the customer is everything. Customer feedback is a pure gold! It’s a great source of tips and ideas what you can do to improve your product and scale sales. Of course, there would be a lot of tips, more or less useful, but if some request is very popular just go and implement it! Also, engage your customers to do some tests, make them partners in this project and after implementing they would be happy and proud to help and more likely to spread the word about your product and extraordinary customer service! I like that you start of very high and get down into some good detail. I initially thought it was just another customer discovery article but there are some nice tidbits and frameworks there. Thank you!